If you like a different kind of vampire flick, then Monster Pictures are releasing something which may be up your street, this coming year. 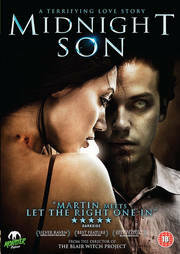 Out in cinemas on 11th January and following up on DVD come 11th February, is Midnight Son. Directed by Scott Leberecht as his debut feature length movie, this stars Zak Kilberg, Maya Parish, Jo D. Jonz, Arlen Escarpeta and Larry Cedar. With a runtime of about 88 minutes, the recommended retail price will be a rather odd £13.27. Alas no details on extras, so presume nothing more than a trailer and you won't be disappointed. This is the story of Jacob, a young man confined to a life of isolation, due to a rare skin disorder that prevents him from being exposed to sunlight. His world opens up when he meets Mary, a local bartender, and falls in love. Tragically, Jacob’s actions become increasingly bizarre as he struggles to cope with the effects of his worsening condition.